When it comes to tooth replacements dental implants are increasingly becoming the treatment of choice, however high treatment costs very often prevent this treatment option in Australia. Hence many customers are looking to south east asia for lower price alternative. In this first blog about dental implants I will try to simplify the concept of dental implants and explain some basic features of dental implants. All implant restorations consist of a fixture - this is the part anchored to the bone, an abutment - this is the part penetrating thru the gums and the prosthesis - the tooth. In a nut shell a fixture is just an anchor ( not too dissimilar to a gib-board anchor) which is screwed or tapped into the bone and will after sufficient healing time be able to carry a tooth, bridge or denture. Obviously this is rather simplified. Implants come in different materials, most of them are titanium but recently we have seen the rise of ceramic implants as well. In terms of materials the important aspect is in fact the surface applied to the implant material as this will directly effect the speed and quality the host bone is attaching to it. This is basically the first hurdle in the treatment as many of the simpler or older technology surfaces will only allow for a slow healing which very often translates to less bone to implant contact. More modern surfaces are generally of the super rough kind which has shown to facilitate fast healing and increases in bone to implant contact. In fact over the last years we have seen a technology race of the implant leaders in getting their surfaces improved. The abutment is a basically a cylinder or similar shaped tube which can be attached to the fixture, hence penetrating thru the gums and allowing a tooth to be either attached to it or even incorporating a tooth shape. Abutments can be pre made (off-shelf abutments) or custom-made in titanium or zirconia. Custom abutments are regarded as the up to dat away to go as it will preserve soft-tissue contour and health much better than the former. However this comes at a price. For ongoing implant health the abutment must a) fit very precisely to the fixture to minimize gaps harboring bacteria and b) of a shape which will allow the connecting screw to stay tight. As screw loosening was a major concern with implants in the past. Screw loosening - the loose screw - will have a major impact on the tissue surrounding the implant. 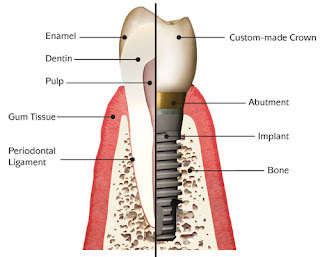 In fact a loose abutment screw can cause total implant failure, either due to implant fracture or inflammation of the bone surrounding the implant. Modern implants very often therefore have internal connector representing either tri-lobes or hexagonal shapes of varying angles which will help to keep the abutment in a secure position. The prosthesis attached to an Implant can range form a single tooth to a complex bridge. It can be screwed to the implant or glued to the abutment. Generally speaking specialist prefer to attach the prosthesis using a screw whereas general practitioners often like to glue. This has often puzzled me. It seems that most general practitioners are using the later technique as they are used to gluing their crowns to teeth and are afraid of the perceived complexity of using a screw. The fit of the prosthesis must fit excellent, where you might get away with a rather sub-optimal fitting prosthesis on a natural tooth, the implant is unforgiving. And that is it. Really not more to it. So why are dental implants so expensive, in fact in Australia and New Zealand most patients who could benefit form dental implants cannot afford them. Well beside the concept is fairly easy - you still need to know where to put the whole to screw the fixture in. Even if the surgeon is only a fairly small distance of this can have a big impact on the implant success. Secondly fixtures and abutments are expensive, said that we currently see hordes of cheap implant manufacturers coming to market with cheaper and cheaper components. But buyer aware lots of these companies are of the backyard workshop type. Done be fooled by fancy names or claims that the implants are produced in countries such as the USA. Most of this implants are distributed by US companies but produced in countries such as Israel, Brazil, India only to name a few. These fixture on first glance look such the same as the more expensive manufacturers, but rest production quality and in particular surface technology is not the same. The same is true for their abutments, with the naked eye everything looks like fitting nicely, but if we were to look at it under magnification the dirty truth comes to light. In fact I have seen abutments which were that bad fitting that magnification was not even required. And lastly implant companies come and go currently at a phenomenal rate, but you have the fixture for life ( or at least for many years). The prosthesis commonly last not as long as the fixtures, so what happens when you need some spare parts of your implants. We currently see more and more patients coming in with odd ball implants who need some maintenance, but surprise,surprise we cannot get any fitting parts. If you are unsure if you are getting a fair deal you might want to contact www.dentalabroadnz.com for an alternative quote. Dental implants usually last for about 12 years. Though more is dependent on the maintenance and regular checkups maintaining the oral hygiene of the implants. 12 years would be a rather midiocre result. Wie know from research going back to the mid 60's that the fixtures do have a life expectancy of 30 years or more - obviously when the approbriate mantainance protocol is observed. I personally have plenty of data from my Clients where Implants are in function for 20 years ( i started implants 20 years ago). Good oral Hygiene is mandatory of course (in patients with poor or fair oral Hygiene no reputable surgeon will place an implant). Dental Implant in India is too good. All-on-4 All-on-6 All-on-8 Implant Treatment. Thanks for sharing the blog it is very important and I believe all the peoples are receiving great information and very helpful for the oral health care, now days people want great smile for this they also want to replace the lost teeth by low cost dental implant India and its city by this people smile confidentially and also improve in its personality by this treatment. India. All those who are suffering from the problems. Read some really great developments in the dental industry on the new tools,dental services and many more. Yes there is a great benefit from dental bridges which is you can cover the gap between two teeth. This procedure help to look crows like real teeths. If anyone is seeking for Best Dental Bridge Treatment in Ludhiana he can visit our website for more details about this. It's really very nice and fantastic post thanks for sharing this with us. Dental work is something that just everyone needs. Our products are ceramic self-ligating brackets, orthodontic pliers suppliers and orthodontic manufacturer china, Orthodontic bands box. However, there are things one must know about the procedure conducted at the best dental clinic in India.If it is a matter of pain, then there is no need to worry. A local anesthetic is applied and a hole drilled into the jawbone into which the implant is fitted. It is less painful than having one’s tooth extracted.